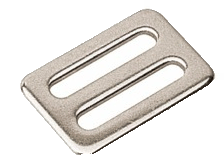 1" stainless steel single bar slides can be used to adjust a strap's length or secure any loose end. The stainless steel model offers maximum strength and corrosion resistance. Single bar slides also work well in combination with other buckles.